These seemingly paradoxical laws have disturbing implications and I did not come easily to their acceptance. But now that I have accepted them, I am not easily compelled to engage propositions that question them. Yet such propositions are ubiquitous. A major motivation for this series was to justify my reluctance to argue past a violation of these laws. Along the way I develop, state, or hint at models of expansive concepts like action, learning, meaning, effectiveness, and communication. I do this at a level of abstraction that I expect many to find trite, uncomfortable, or incomprehensible. Many of the reasons for this amount to my personal limitations or preferences, but some are important to the argument itself. I was not led to diverse domains by fancy. On the contrary, I have tried to make my point with fewest parts. But that arguments stand on acceptance – frequently implicit – of a multiplicity of models spanning diverse fields is itself a major part of my argument. It takes many words to explicitly lay out what those positions are, how they are connected, and why they are necessary – even if one treats them as axiomatic backstops rather than attempting to prove them. It could be justifiably demanded that I concretely defend my hand-wavy statements. Which would take a carefully written book for nearly every paragraph and for many of the sentences. Fortunately, I can also justifiably deny this request because such books already exist. There are rich intellectual traditions that defend and criticize every element of what I unabashedly state. My reading page will get you started as would a tour of philosophy. But these conflicting traditions are all Pandora’s boxes of evermore refined arguments and connections. Persistent attempts to follow justifications to reconciliation or truth are what led me to write this series. Being more concrete will not provide certainty; it will instead change the topic towards a survey of intellectual traditions or, perhaps, a contribution to one of them. Which are fine goals, but not the ones I am pursuing. And it risks misrepresenting sophisticated positions or activating preconceptions of them. I am fairly confident that, with some allowance for my limitations as a writer, the positions I presented can be defended, but I do not claim that they can be proven. Such a proof would violate the Law of Plurality. In Significance of Agreement I unpack the reasons we seek agreement. In the process, I show how absolute belief permeates existence; how essential it is to society and individuals; how it is discounted only because it is taken for granted. Agreement – and absolute beliefs on which it usually rests – validate our collective goals, standards, ethics, and assumptions; power the effectiveness of our efforts; and underlie our individual sense of meaning and worth. In Ingredients of Action I develop a psychological model of action that showcases the importance of clarity – a consequence of absolute belief. I connect perseverance to properties of identity, faith in vision, and their congruence with action. I show how individual capabilities, vision, and identity evolve from consequences of action itself; how such action is inexorably connected to communal projects; how acceptance of this connection is predicated on the perceived truth and goodness of communal visions; and how this perception is validated by communal effectiveness, integrity, and fairness. I thus detail the connection of societal agreement and effectiveness to individual identity; and of absolute beliefs – on which identity rests – to individual motivation, effectiveness, ethics, and purpose. In Emergence of Identity and Belief I trace the evolution of these relationships back to in utero, through an inductive, pride-centered model of child development. I demonstrate how absolute belief underlies everything from learning, fairness, and goodness to our will to act. Absolute belief is a vital, innate, and powerful part of human psychology. We evolved with a predisposition to perceive truth, structure, and purpose. We evolved to live in small groups that shared high-level axioms, models, goals, and strategies. Life in these closed, tight-knit, stable communities naturally reinforced shared beliefs and goals. Connections established in childhood transferred well to adult life. Individual and communal lives were sufficiently in sync to affirm reliability of communal models. The idea of a single trustworthy answer is woven deeply into our nature, culture, and institutions. Over time, we have moved to larger, less cohesive, and more impersonal communities; we have encouraged openness and movement; we have disempowered norm-enforcing institutions and ideas. But we still assume that our values and goals are grounded in absolutes. Confidence in such values and goals, and their connection to our identity, encourages us to contribute, pursue recognition, prove goodness, and seek meaning on the communal stage – a stage that is increasingly global. The conviction in preeminence of models and strategies based on correct principles biases our efforts towards theory and agreement. In Perfect Worlds and Their Limits I describe how this idealism leads the charge to improve the world, but faces unresolvable challenges to acceptance of its theoretically coherent blank-slate strategies – as well as limitations to the validity and usefulness of principles and theories themselves. In Banality of Problems and the Limits of Scalability I detail how pragmatic realities and everyday trivialities permeate and derail execution of even the simplest tasks with ostensibly obvious goals, models, and strategies. I trace how attempts to root-cause and subdue these difficulties face unresolvable challenges. And I show what underlies high-quality, effective execution and why even its rare examples are limited in scale, scope, and permanence – and are thus inadequate for universal aspirations. The challenges and limitations of both theory and practice lead to failures across scopes. Thinkers and doers oftentimes condescendingly feel that obvious mistakes of the other are responsible for delays, costs, and failures while their own astute and steadfast efforts under resulting difficult conditions are inadequately recognized. Even when such disputes rise above reductionist questioning of specific decisions – never mind of ethics, competence, or commitment – they rarely escape friction over the comparative merits of strategy and execution, explicit and implicit knowledge, coherence and pragmatism. But success and failure are both possible with most combinations of these. In Anatomy of Action and Understanding I present a fundamental model of action. I trace development of capabilities, goals, strategies, and models; show their frequent gaps and conflicts; and describe the difficulties of constraints, feedback, and integration. The model sheds light on the indispensable value of both coordinated theoretical coherence and effective practical fingerspitzengefühl as well as on the reasons why they are so rare and challenging to scale. With this model in place, I revisit the pursuit of effectiveness and improvement in Magic and the Challenge of Action. I begin with resistance to change that frustrates optimists and demands an infuriating amount of their attention. I root this resistance in abstraction, faith, and habits that result from the complex and incomplete nature of action hierarchies. I show that attempts to remove such magic are misguided because it offers powerful and indispensable benefits. Furthermore, hopes of eliminating just its worst types are only a bit less naive because the types are difficult to tell apart, all magic is deeply woven in, and we have evolved strong defenses for magic as such. I then switch focus to implementation. Most idealists pin their hopes for progress on communication leading to convergence. I use action hierarchies and magic to show why this is untenable. I then dig deeper to the fundamental assumptions that underlie such hopes: the possession of a superior, complete, and coherent action hierarchy and the ability of teach it. I show that while such hierarchies are indeed extremely powerful, they are preciously rare and nearly impossible to distinguish from plentiful imposters. Those who believe they possess one are generally mistaken. To assure possession of the real thing, we can try to understand or develop our hierarchy from first principles instead of accepting it wholesale. This task is difficult, but possible – and is one of the fountainheads of innovation, progress, and competitive advantage. But even possession of a truly coherent hierarchy turns out to be insufficient for propagating it. We can only turn insights into systems that empower the multitude with magic. Or we can deploy them in concert with the few who understand. Both eventually decohere. The above discussion establishes why universal convergence is impossible; why effective efforts are necessarily limited in time, scope, or scale; and why the world must remain imperfect. But a lingering suspicion may remain that these limitations aren’t inherent: that we may be able to transcend them with advancements in education, science, or technology. In Magical Foundations of Agreement I attempt to put the nail in the coffin of convergence by detailing why these limitations are theoretically inescapable. I show that the first principles on which coherent hierarchies rest are always disputable and that the methods used to express and resolve such disputes are themselves grounded in their own disputable principles. Our positions ultimately rest on faith. Furthermore, even we if agreed to converge on any single set of principles, models, and methods, its massive size and bootstrapping challenges would require for the whole set to be accepted simultaneously and instantaneously by everyone. Even if this feat were somehow possible, the resulting acceptance wouldn’t be stable because of human variability. And even if such stable convergence were achieved, destabilizing tensions between goals would remain. I conclude by dismissing the refusal to choose sides. So the truths on which we base our beliefs and agreements ultimately rest on faith in axioms and thus can always be disputed. But agreement is essential for coordinated action and absolute belief in our foundations is vital for our effectiveness, goodness, identity, and sense of meaning. The arguments I presented aren’t new. For much of human existence my laws would scarcely need articulation – nor were they contradictory. Tribes, casts, and city-states took it for granted that absolute beliefs were intrinsic to one’s role. With ancestry, birthplace, or shared experience underneath group loyalty, there were few means, and little desire, to convince or assimilate outsiders. And polytheism reaffirmed inevitability of variety, tension, and competition. Monotheistic religions offered a universally correct answer and, with the rise of Christianity, a path to transcend the beliefs of one’s birth. Absolute belief morphed into belief in absolutes. Faith replaced acceptance of tension and provided a path – and later an imperative – to seek convergence. The Enlightenment attempted to transcend faith – to replace belief in absolutes with absolute truths. As confidence in its methods increased, so did the willingness to dismantle existing beliefs, no matter how sacred, in pursuit of such truths. Belief in the value of absolute belief was itself opened to inquiry and became its casualty. With time, as Alasdair MacIntyre argues brilliantly in After Virtue, critiques have come full circle to expose contradictions in every possible path to truth. Belief regained acceptance, but only in the temperamental and weak purview of individual choice. Furthermore, it now conflicted with products of millennia of striving towards universal convergence. The Laws of Absolute Belief and Plurality grew disputable and paradoxical. This evolution left us with a rich body of sophisticated arguments and positions. Although rarely expanded fully in everyday discourse, these arguments aren’t unfamiliar any more than they are new. Contemporary debates frequently condition solutions on agreement. Arguments commonly depend on absoluteness of truth or morality or justice. At the same time, attacks on absolutes are a legion. Foundations of existing beliefs are routinely exposed as shaky, often viciously and indiscriminately. The importance of such beliefs to effectiveness, motivation, morality, creativity, and happiness is downplayed or denied. Yet absolute belief is commonly vilified as dangerous precisely because of its terrifying effectiveness. Surprisingly frequently, arguments along all these lines are pursued by the same individuals; a feat made possible by instinctive management of cognitive dissonance with techniques like compartmentalization and, ultimately, by absolute belief in the privileged position of one’s truths and trade-offs. 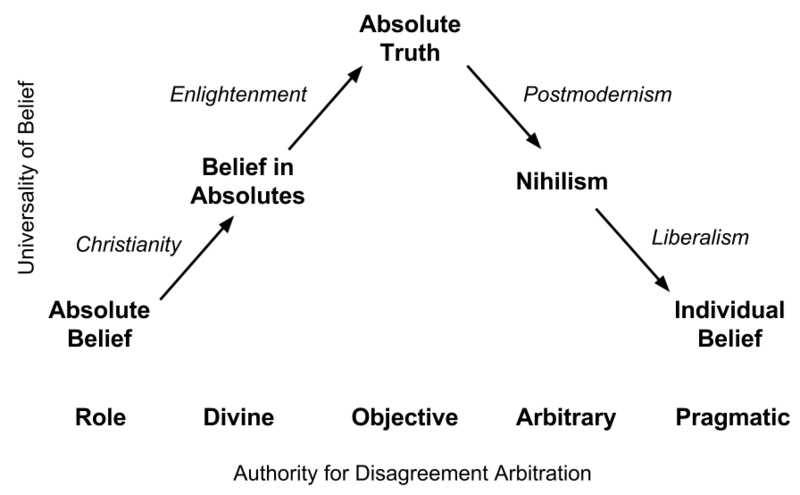 Arguments for absolute belief or agreement, as well as arguments for their impossibility or danger or arbitrariness, can be deep, interesting, and important. But wise conclusions must balance, not choose between, these positions, because both reveal essential truths despite being in unresolvable tension. The essence of wisdom is the caliber of such balancing of opposing truths. The essence of tragedy is the delicacy and inconsistency of any such balance. My favorite encapsulation of the profundity of tension and essence of wisdom is the Serenity Prayer:1The Serenity Prayer is the inspiration for GrowWiser’s “To know the difference” tagline. I contend that an unchangeable thing to accept is existence of disagreement and, by extension, existence of conflicting goals, beliefs, and groups. Yet this acceptance must not sacrifice courageous striving on which individual flourishing and societal progress depend. Human beings did not evolve to perform such an elaborate balancing act and I am skeptical of our capacity for it. The magnitude of the psychological challenge is evident with existential depression. David Chapman’s interpretation of Robert Kegan’s stages of adult development, with its nihilistic valley at stage 4.5, offers another insightful perspective.2David Chapman’s Meaningness project, along with the referenced post, significantly overlap with the ideas I tried to develop in this series. If my words are confusing, you might find clarity in his. But unnaturalness and difficulty don’t make acceptance any less necessary for those committed to seek truth or maximize large-scale effectiveness. Which isn’t to say that everyone must seek truth or act outside their group and thus traverse the stages. If acceptance of plurality seems obvious or easy – rather than a terrifying gateway to detachment, nihilism, or relativism – then think about what makes you argue, strive, and sacrifice; what makes you proud, ashamed, and furious; what you find good, evil, sacred, and just. Then consider whether you’d have no trouble accepting your own inverse; whether you could continue unperturbed if you both got comparable rewards and recognition. Acceptance of plurality doesn’t allow exceptions. Nothing rises to veracity insusceptible to legitimate, good-faith disagreement: not rationality, not ethics, not objectivity, not faith. It is in tension with action because we build ourselves on top of such absolute beliefs. I presented my tension-balancing synthesis in Plurality of Absolutes. This series was its elaboration and defense. The Plurality of Absolutes mindset accepts the multitude of conflicting groups with serenity; it places no hope in their elimination and thus limits efforts to correct, consolidate, or improve others. Yet it unabashedly supports courageous pursuit of absolutes within the confines of such groups and does not require acceptance of plurality from those within this limit. Groups accept existence of conflicting efforts, begrudgingly but peacefully, as inevitable constraints and allow their relative merits to emerge in amoral competition through markets and politics. The feverish desire to push one’s truth beyond this limit is tamed – with the help of intra-group norms, in-group guardians, and inter-group competition – by recognition of the impossibility of convergence. I believe Plurality of Absolutes to be both a realistic model of how the world works and a justifiable escape hatch from philosophical conundrums into healthy action. I want to preempt being misconstrued as asserting futility of all striving for agreement. Two people – whether friends, enemies, or strangers – attempting to move a couch up the stairs can definitely agree on who should take the front and who the back and it would be quite useful for them to do so. It is when they attempt to define the relative amount of recognition due to each of their contributions, or make their conclusions universal, that they risk descending into unresolvable conflicts. Similarly, communities – whether aligned, competitive, or indifferent – can come together for pragmatic ends, or for shared principles, but risk trouble if they attempt to trace such high-level agreement to common axioms. Such coming together is how communities form. Arguments and ideas, along with practical pressures and their interpretations, drive people to find common ground and build cooperative enterprises. But this consensus is only stable at a sufficiently high level of abstraction and functional communities invariably build protections from pushing it too far: modesty, manners, rituals, agreeing to disagree, unquestionable truths, chain-of-command, and checks on busybodies are some examples. My argument is not that proof is impossible, that all positions are equal, or that striving for truth is as good as not. My contention, simply put, is that positions are axiomatic systems.3Robert G. Brown expands on the same claim in his draft of Axioms. While axioms can always be rejected, proof is possible within any accepted axiom set. Furthermore – outside of purely theoretical constructs, like those within mathematics – positions are grounded in real-world truths, even if we access them through systems of belief. Positions can thus, at minimum, be judged by internal coherence and external performance. To strive for truth is to work to understand one’s axioms, validate coherence, and test effectiveness. Within every axiomatic system, those who strive this way will have advantages over those who don’t. Not only because of resulting competence, but because our beliefs must rest on perception of absolute – or defensible, for those beyond Keagan’s stage 4 – truth to motivate meaningfully. This perception is fragile in proportion to being imaginary, making both realism and confidence valuable. Continued questioning of even the most accepted principles is an essential realism aid. But since it is endless and demotivating, one must be able to disengage from it to put its lessons to use. Unsurprisingly, once interactions turn competitive, arguments rarely remain good faith. They are propaganda – one of the amoral weapons of inter-group competition and intra-group guidance. As such, far from being useless, they are an essential tool in pragmatic action, but must not be mistaken for good-faith, truth-seeking debate. All belief and action rest on principles that can be challenged and expose consequences that may be undesirable. Even with most thoroughly developed positions, it eventually becomes necessary to choose sides in order to judge or act. The bar to re-engage chosen principles must then rise, especially when neither competence nor good faith of the objectors can be reliably ascertained. The decision to revisit them ought to come from internal suspicion that positions have been undermined rather than external demands for elaboration. Many reasons compelled me to write this series. Significant among them was to provide a generic defense against demands for positions to be proven or reconciled beyond all limits: to give actors the tools to confidently assert – to themselves and others – that their positions don’t need to satisfy all the objections to be defensible – indeed, that they cannot – so that, with pride and courage, they can instead act. 1. ↑ The Serenity Prayer is the inspiration for GrowWiser’s “To know the difference” tagline. 2. ↑ David Chapman’s Meaningness project, along with the referenced post, significantly overlap with the ideas I tried to develop in this series. If my words are confusing, you might find clarity in his. 3. ↑ Robert G. Brown expands on the same claim in his draft of Axioms.